What Makes a Great Catering Staff? 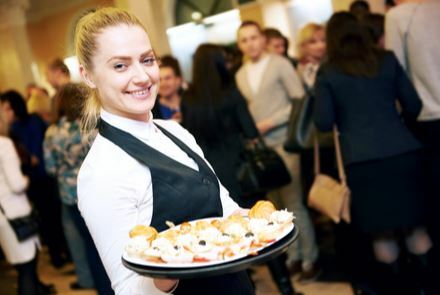 Undoubtedly, having a great catering staff will prove to be a blessing when you’re working at an event and serving food to dozens or even hundreds of people. However, a great catering staff is not built overnight. Let’s take a look at some of the things that go into making a staff that is capable of catering for your company. It doesn’t matter if you welcome employees with no catering experience or some with an extensive catering work history. They still need to be trained properly so that they understand how catering is done within your company. This will make them a full-fledged member of your team and bring them up to speed on how things are done within your catering staff. They’re able to work quickly without making mistakes. A catering staff needs to be able to do whatever needs to be done to make customers happy. More often than not, that means working quickly and making sure people have the food and drinks they’re looking for. At the same time, a catering staff needs to avoid making crucial mistakes like bringing the wrong food to someone or spilling a piping-hot plate of food on the ground. They’re capable of delivering excellent customer service. Your catering staff will often communicate directly with customers. They need to know how to conduct themselves and what they can and cannot say to those they’re serving. You want customers to feel like they’re getting great service at all times from your catering staff. They’re always on time and willing to stick around until a job is finished. If someone on your catering staff fails to show up for a job, it makes life more difficult for everyone. It can send people scrambling and lead to substandard service. Additionally, there are going to be times when catering jobs run late. Having a staff that’s willing to stick around as long as you need them to is essential. R&R Caterers can provide you with an excellent catering staff for your next event. Call us at 215-638-7376 today for all of your off site party and event catering needs.